I’ve been writing a series of articles here about change and how learning professionals in the 21st century must become engaged in Learning to Lead Change and then train others in the organization on how to go about it as well. They also need to understand the many forms of resistance that explain Why Change Projects Fail. In order to bypass or overcome resistance to change and be effective leaders of change, you need a decent model or framework to keep yourself on task and moving forward. There is no shortage of change models to choose from, and you also needn’t pick only one. There may be instances in which one model will work better than another, so think of them as tools in your change toolbox. 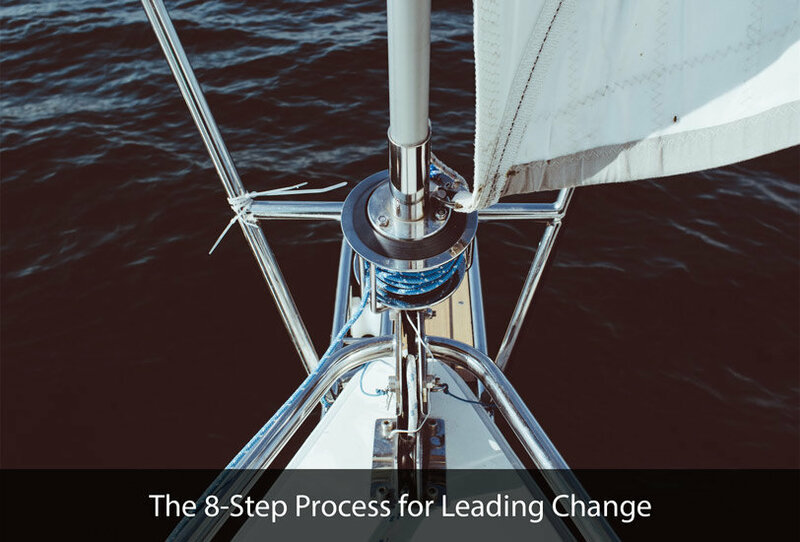 One that has been incredibly popular is the 8-Step Process for Leading Change developed by John Kotter. Create a Sense of Urgency. The tricky thing here is to not scare people so much with potential gloom and doom that they wind up resisting the change. Yes, there is probably some “we have to do this because if we don’t, such-and-such negative thing will happen,” but also be sure to have some “we want to do this because it will result in such-and-such good outcomes.” What you want is excitement about positive possibilities, not fear of destruction. Build a Guiding Coalition. There’s no substitute for having a collection of powerful, influential people from key positions on board to help disseminate that sense of urgency. Form a Strategic Vision and Initiatives. It’s really hard to get from point A to point B if you don’t know what point B even looks like. Having a clear vision helps steer the entire project. Then you also need a set of initiatives that will achieve the vision. Enlist a Volunteer Army. The guiding coalition is key, but so are as many “boots on the ground” as possible. You need a large force of people who are ready, willing and able to help make it happen. Remove Obstacles. Is resistance popping up? Why? What’s in the way of the change process? Identifying and removing barriers to change is absolutely essential. Generate Short-Term Wins. There’s nothing like some early successes to build momentum in a change effort. You’ve got to highlight early victories, celebrate them, and correlate them to results. This necessarily involves robust tracking and evaluation processes. Sustain Acceleration. As credibility builds through step 6, use that as leverage to remove more obstacles, make more changes that align everything in the organization to the vision. Institute Change. This is about making sure the change is embedded in the organization’s culture, such that it will continue whether leadership changes or not. You have to keep telling the success stories to make this happen. The Kotter model is not without its critics. Some feel that it makes change feel like a one-time event that can easily be “managed.” This is where it’s useful to remind ourselves of Peter Vaill’s “permanent white water” concept around change. There’s no way to avoid the fact that things in an organization’s environment change all the time, over which you have little or not control. In that sense, can you only “react” to that kind of change? I argue no, because part of leading change is having the foresight to anticipate trends and lead proactive change, which is exactly where a model like Kotter’s comes in very handy. Others say the Kotter model is much to top-down, as if change can only come from the c-suite. I don’t think it’s ruling out change starting elsewhere, but I do think it’s highlighting the fact that leadership is all about change, so the formal leaders of an organization should be using this model all the time, as should anyone at any level in the organization trying to make change happen. In spite of such criticisms, the Kotter model has stood the test of time and public opinion, and deserves a special spot in your change toolkit.